Art is the pure expression of who you are at this moment in time, free from any illness. “It Feels Like Freedom…” When Creativity Transends a Diagnosis, is an art exhibit I had the pleasure of viewing at The Philadelphia Foundation. 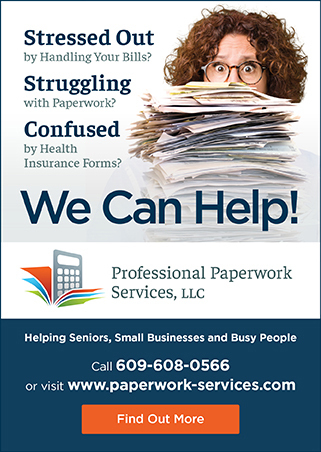 It comes out of the work of ARTZ Philadelphia a 501(c3) founded five years ago by Susan Shifrin, PhD. When you get Susan talking about ARTZ Philadelphia, and its’ programs, the passion and joy she has for this work is on full display. You can hear it in her voice, see it in her eyes and her hands, as she motions to describe the people living with dementia who participate, the art they create, and the volunteers. 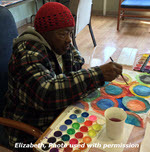 ARTZ in the Making is the hands-on making of art in care communities, mostly with residents living with dementia. 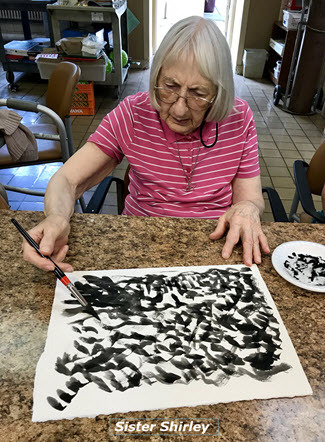 Trained artist-facilitators encourage imagination, human connection and casual conversation among the intimate group of 6-8 residents. Using a “process over product” approach, the media used are full of color, sparkle and textured materials. 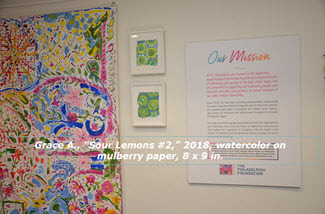 The banners displayed at the Philadelphia Foundation exhibit, are part of large-scale projects carried out during periodic ARTZ Philadelphia Community Engagement Days. 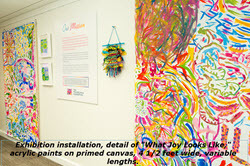 ARTZ Philadelphia participants and volunteers, sitting around a blank nine-foot long canvas, were asked: “What does joy look like?” This inter-generational project with contributors from early stage dementia to those in hospice care banded together to creatively express themselves. 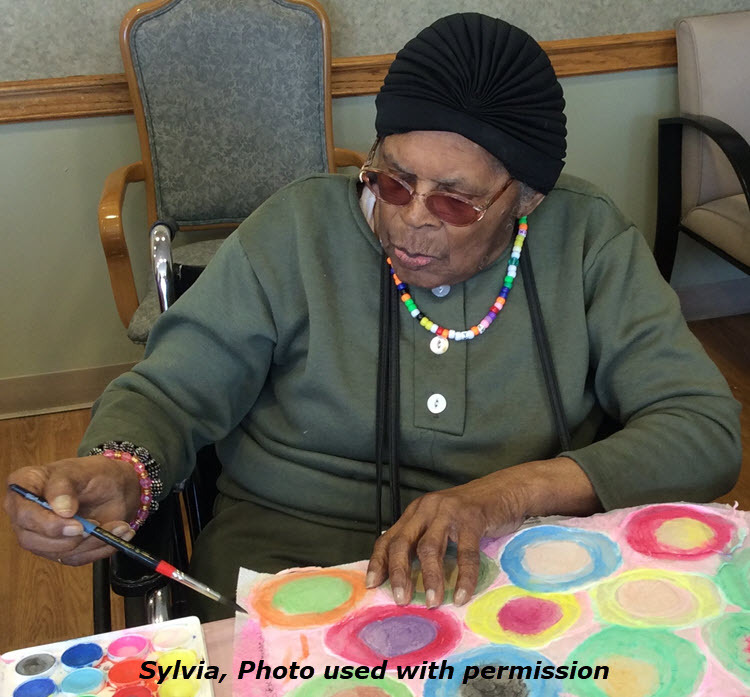 According to Susan, some care community residents have been participating in the ARTZ in the Making program for a number of years, and it is heartwarming that the close relationships formed within the program are not lost as people progress through the disease together. The weavings on display comes out of community engagement days as well. Like the banner, the materials used to create the weavings are based on the colors of ARTZ Philadelphia. 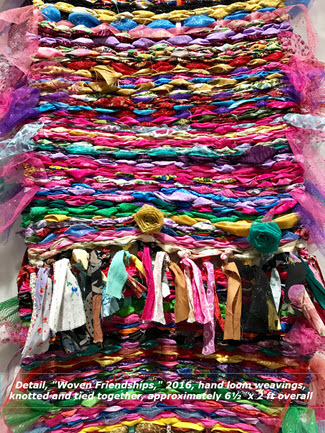 When seen in person, the different colors, textures and materials that glitter all embody the joy of making art and are an expression of empowerment. 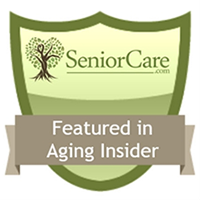 Smaller projects are made by participants in care communities where volunteers provide encouragement, share stories and make participants feel special. 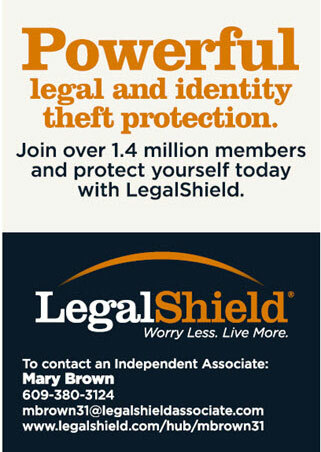 Programs generally take place once or twice a month. Supplies and projects are starting points, but participants often go off on their own. Most of the art-making projects are designed in-house by Sue Brown, the lead facilitator of ARTZ in the Making programs. 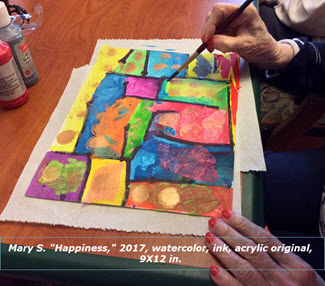 However, ARTZ is also able to provide such specialized programs for people in the later stages of dementia as “Opening Minds Through Art”, another research-based program developed at the Scripps Gerontology Center at Miami University in Ohio. And art is the vehicle to tell the story. It was during the creation of this picture that Sister Shirley shared a story of her work during her earlier days as a missionary. “After a day filled with ministering to the sick and dying, the sisters would leave the chaos of the day to seek the quiet and calm of the Himalayas” Paraphrased from Sister Shirley’s story. In addition to ARTZ in the Making, ARTZ Philadelphia runs these programs. ARTZ @ The Museum launched in 2014, starts with the art. Groups are limited in size to six to eight visitors with dementia plus their care partners, to ensure an intimate and comfortable experience for everyone. Together for an hour in a gallery setting, they look at two to three works of art. With the help of with a warm, welcoming and highly trained facilitator, the group is immersed in conversation that starts with open ended questions. 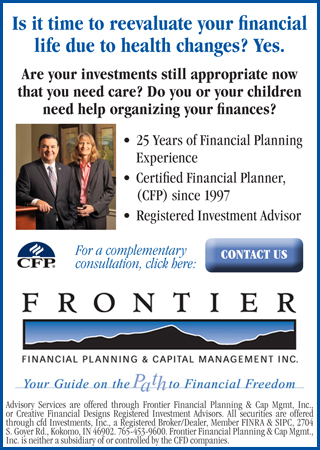 This meaningful, invigorating and joyful program is free of charge. ARTZ on the Road involves ARTZ Philadelphia staff in facilitating arts-based group conversations among people living with dementia in residential care communities. Works of art, the memories they evoke and anything else that comes up along the way are all fair game. Conversations about art are sometimes paired with art-making and other creative experiences. 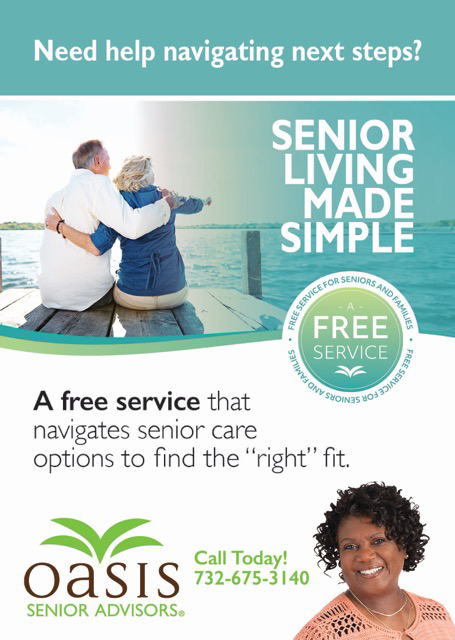 Cafés for Care Partners is a program for care partners only, that meets for two to three hours every other month. Care partners will visit a new museum to vet it for ARTZ Philadelphia one month, and another month take a walk through an arboretum. It is designed to be an informal gathering and respite time. This time together outside of a formal support group is social, offering a chance to catch up with old friends and make new ones. ARTZ Philadelphia, through its programming, is helping care partners see their loved one today, through the art they create and through the insights and laughter they share in conversation with others while looking at works of art or everyday objects; listening to music; and engaging with other multi-sensory experiences. And for Susan and her small staff, knowing that their programming creates heart to heart connections, brings them joy and a renewed sense of purpose. * To purchase, please contact Susan Shifrin at shifrin@artzphilly.org or (610) 721-1606 for further information.